This page has circuits that use infrared position sensors that are available from may sources on the internet. The circuit board used in the testing and example circuits is shown below. Link to the device in the picture. One use for the Prefab IR Sensors is inputs for robotics controllers. They can also be used in many model railroad applications either between the rails, across the tracks or beside the track. The IR phototransistor's case is dark so that most of the visible light is blocked but very strong light sources can trigger the circuit. 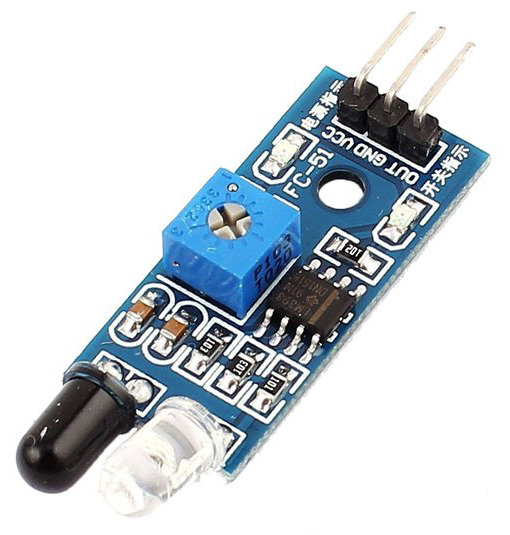 The example Prefab sensor uses a LM393, dual voltage comparator as the output device. These comparators have a typical output current rating of 16 milliamps. The detection indicator LED draws 3 mA that will be included in the comparator's output current capacity. The output of the Prefab sensors can be used directly for 5 volt inputs such as microcontrollers and logic devices. A pull-up resistor is not required. The example sensor does not have hysteresis, therefore, the output will be slow to change states in some circumstances. This could make the sensors unsuitable as a direct input to devices or circuits that cannot tolerate noise or jitter. If an output with a higher voltage or current capacity is needed, transistors or other devices can be added to the circuit. The IR LED and the phototransistor can be dismounted from the circuit board and reconnected using wires for easier between the tracks installation and for above or across the tracks. For above or across the tracks use, the operation of the sensor is reversed and the output will go HIGH when the beam is blocked. The LED and phototransistor require are not particularly easy to desolder due to the small size of the mounting holes. Take care to not overheat these components. The LED and phototransistor could also be replaced by matched 3mm LEDs and phototransistors. The phototransitor could be encased in heatshrink tubing to block external light sources if needed.